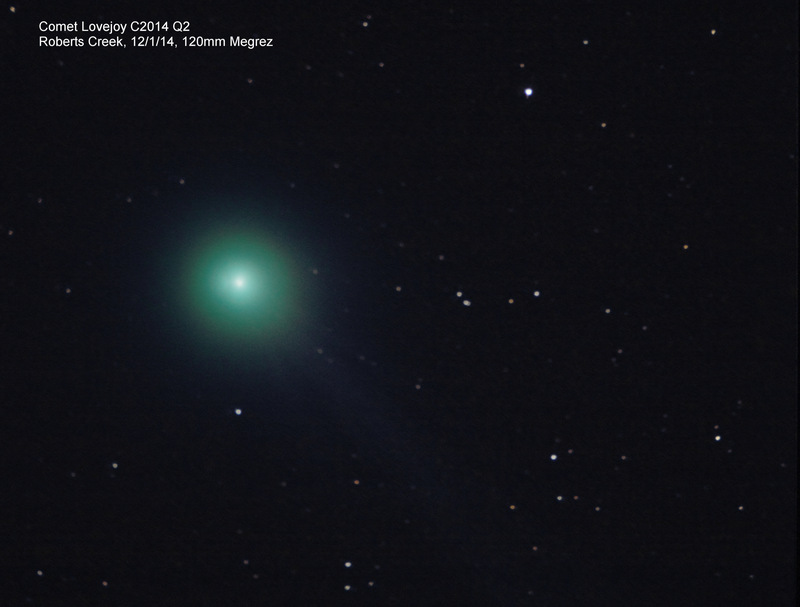 I want to share some photos that members got of Comet Lovejoy. Clear skies on the 7th of January gave our past president Mike Bradley his first opportunity to view comet Lovejoy, and it was pretty impressive. He could see it with binoculars without trouble but in his telescope its head made up a full half of his 26mm eyepiece. He took this photo with a DSLR camera, a simple stack of six 20-40 second images. There is even some evidence of a very faint tail in the photos that wasn’t visible in the scope only view. Mike tried using a UHC filter but it didn’t lead to any improvement. Mike did not have star tracking turned on. Fortunately the comet is moving relatively slowly so there wasn’t too much blurring. On the 21st conditions in Roberts Creek were not so good but they improved a bit later. Mike shot a stack of 10 x 120 second images at 800 ISO. This time the tail is starting to show! Comet 15P/Finlay is back and apparently it has reached a brightness level making it visible in binoculars this time. Currently it is visible in the western sky at the end of evening twilight. 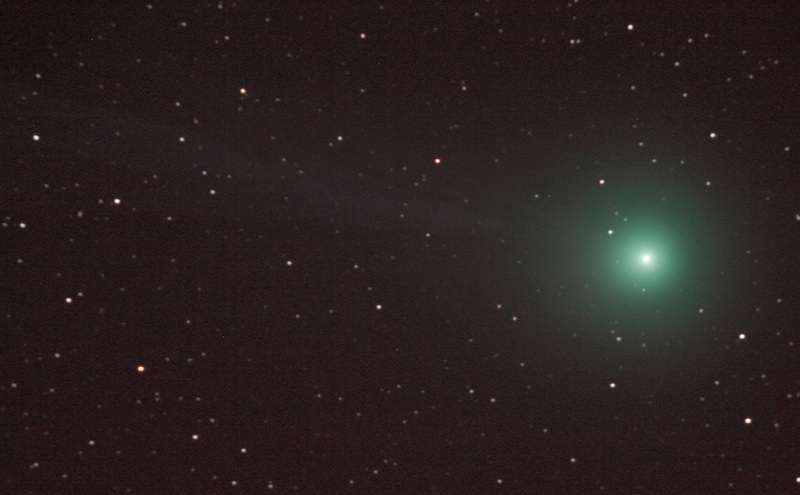 If you haven’t seen comet Lovejoy yet its putting on its best show now and during the upcoming moonless nights. Its up pretty early now and is now above Orion, not below. I saw it last night through a foggy sky in my 70mm binos and it was very bright, large and diffuse. I would think it would be an easy naked eye object from the sunshine coast on a clear evening. At 7:30 PM, 13 February 2015,, at the Sunshine Coast Art Centre, 5714 Medusa St., Sechelt, our speaker for the Sunshine Coast Centre of the RASC will be Dr. Kristen Larson, Associate Professor at Western Washington University. 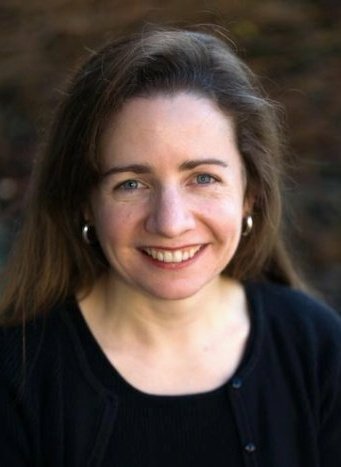 Kristen got her BS at the University of California at San Diego in1993 and her MS and PhD at the Rensselaer Polytechnic Institute in1999. Understanding the dust in the interstellar medium, the stuff between the stars, is key to understanding how stars form and what happens when stars die. This talk will illustrate some of the properties of interstellar dust and how local dust changes our view of the distant universe. Progress on current research to map the location of dust clouds in our own Milky Way Galaxy will be presented. RASC Vice President Chris Gainor will also be attending this presentation to meet with members of our Centre. Our past president Mike sent us an important notice regarding a time change that will affect everyone’s telescope mounts. Don’t forget because if you don’t, your GoTos will be less accurate (or maybe more accurate?) than usual!!! announced the introduction of a time step to occur at the end of June, 2015. 5. UTC and all time scales based on UTC will be affected by this adjustment. navigation message transmitted by satellites will change.